This small classic hair bow is ideal for the little wonder in your life. Even the finest hair will hold our bow because of our original design covered clippie. 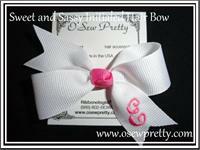 A great way to personalize your bows! 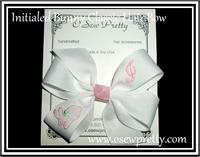 Don't forget to check out all are other personalized hair bows. 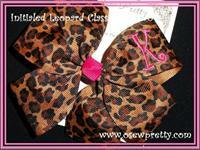 This is another great way to personalize your bows! A classic style hair bows made from Zebra, Leopard, Giraffe, Dalmatian or cow print ribbon with child first initail monogrammed on the loop of the bow. 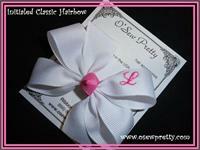 A classically tailored hair bow that you design to coordinate with her special Valentine's Day outfit. Shown in the light pink polka dot with white monogrammed button and light pink initial. Available in over 150 colors, the combinations are endless! These are just too cute! Shown in the light pink polka with white monogrammed button and light pink initial, But available in over 150 colors, the combinations are endless. 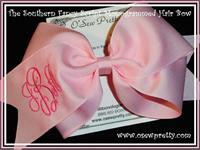 See what all the buzz is about with this busy little bee monogrammed button hair bow. Let her show off her age all year long with these colorful "I'm this many hair bow." Available in hundreds of color combinations. 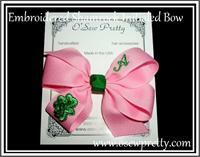 A Personalize St Patrick's Day Hair bow for your little Irish princess!